On the 14th February, 1966! 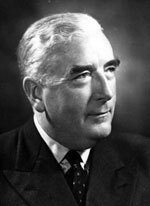 1966 was also the year long-serving Prime Minister Robert Menzies, famous, among other things, for his bushy dark brows and double-breasted suits, retired after eighteen years in power. For some, he was the only Prime Minister they had ever known. Australian's were, by and large, a conservative bunch during the post-war boom period - we didn't like to rock the boat too much. Menzies had presided over a period of relative calm and was perceived as 'safe' and familiar. Certainly, it's hard to imagine a Prime Minister today equalling or surpassing that record. Menzies was replaced by the ill-fated Harold Holt, who disappeared, presumed drowned, while swimming at Cheviot Beach in Victoria, just a year later. Although the decision to enter the Vietnam war had stirred controversy, as far as the government of the day was concerned, we were all the way with LBJ! (Lyndon Baines Johnson) and conscription was introduced through a heavily criticised lottery system in 1964.By 1966 the war was heating up and the US launched a major escalation, requesting greater support from its allies in the region. A new Australian Task Force was dispatched and established its Phuoc Tuy operations base at Nui Dat. 108 soldiers of D Coy held off an enemy force, estimated at over 2000, for four hours in the middle of a tropical downpour. They were greatly assisted by a timely ammunition resupply by RAAF helicopters, close fire support from Australian artillery, and the arrival of reinforcements in APCs as night fell. The armoured vehicles had been delayed because they had to 'swim' across a flooded creek and fight through groups of enemy on the way. At night the Viet Cong withdrew with their casualties, leaving behind 245 dead. Seventeen Australians were killed and 25 wounded. It was one of the heaviest battles of the war Australians had fought in. 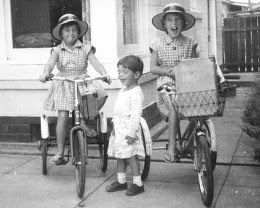 On January 26, 1966; a hot summer's day and the national Australia Day holiday, three South Australian children disappeared without a trace. The children - Jane, Arnna and Grant Beaumont, aged 9, 7 and 4 respectively, had travelled on their own from their home in the suburbs of Adelaide to a local beach by bus. Due to the public holiday there were plenty of people on the beach that day, some who had spotted the children playing in the water and on the grass in the picnic area. Mrs. Beaumont was expecting the children home at noon and when they didn't arrive, she assumed they'd missed the bus and would catch the next one at two o'clock. However, two o'clock came and went an the children never arrived. Despite heavy publicity and a massive nation-wide search, they were never seen again. Although it seems strange, even negligent, by today's standards, to allow three very young and unaccompanied children to go traipsing off to the beach, the Beaumont's were not, at the time at least, publicly criticised for their laxity. We were, it seems, more innocent and less protective and paranoid than we are today. The Beaumont case was to become one of Australia''s most notorious unsolved crimes and ushered in a new age of parental fear and suspicion. Up until 1966, Australian immigration had been largely restricted to Europeans, with some gradually introduced concessions introduced over the years, for Japanese war brides and as one politician put it at the time, "distinguished and highly qualified Asians". In 1957 a bill had been introduced to allow non-Europeans who had been residents for over 15 years to become citizens. In 1966 however, sensing the winds of social and economic change, the Holt government dissolved what was known as the White Australia Policy - a disciminatory rule designed to ensure Australia remained what wartime Prime Minister John Curtin had described as, " a country that shall remain forever the home of the descendants of those people who came here in peace in order to establish in the South Seas an outpost of the British race". From then on non-European immigration increased gradually year by year, infusing Australia with a variety of rich cultural influences and a wealth of diversity. 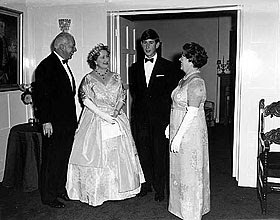 From the 30th January to the 1st of August 1966, the Monarch's eldest son graced us with a stay at one of our top private educational establishments - Geelong Grammar's Timbertop School. In 1965 visiting London model Jean Shrimpton had shocked the Australian public by turning up to the Melbourne cup hatless, sleeveless and in a mini-skirt. However, by 1966 mini-skirts had moved beyond the fashion periphery and into the mainstream. The 60s in general had seen a radical shift in fashion from the full skirts, pony tails and twinsets of the 1950s to the London inspired hip gear of the Mods which we began to design and manufacture ourselves. Culturally and socially we had gradually been breaking away from the conformity and conservatism of the immediate post-war period toward a more relaxed style, in attitude as well as clothes. Up until the 60s many older Australians had still thought of themselves as "British" but in 1966 we fancied ourselves as totally with-it, with a new influx of people from diverse cultures, our own locally grown bands, artists, designers and TV shows. Australia was shaking off its cultural cringe.